L.A.S.R doesn't just make awesome software, they also know how to train correctly with a firearm. You may recall from the interview we published with John, the founder of L.A.S.R. 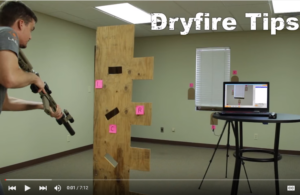 earlier this year that they are the industry leaders in software to assist in and give feedback from at home dry fire or laser simulated training. In part because they are awesome, and no doubt in part to help people understand how they can leverage the LASR product, John built out a series of 18 great training videos that he has compiled into a YouTube playlist. This turned into a larger project when they realized how much need there is in the industry for tips on how to train. That is why they launched the website, www.dryfiretips.com to host additional content for shooters. I would strongly recommend that you subscribe to the YouTube channel and review the video playlist (embedded below).